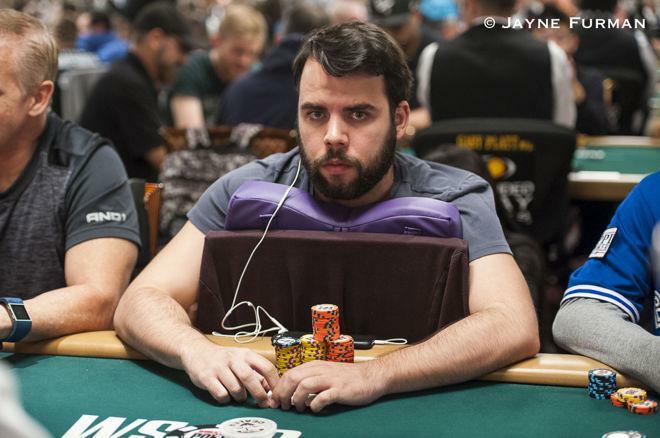 Spanish pro @zarco1128 beat out a tough final table to add a SCOOP title and $234K to his poker resume. It was Spanish pro Javier “minusth3bear” Zarco who emerged from the 675-entry field to grab his first major online title along with a $233,909 payday. A total of 80 players got a piece of the $1,350,000 prize pool, with a min-cash worth $7,742. Making the money, but not the top 45 who returned for Day 2, included 2017 American GPI Player of the Year Bryn Kenney, Andrey "Kroko-dill" Zaichenko and two-time Super Tuesday champ Jon "apestyles" Van Fleet. Austria’s “FourSixFour”, who won last year’s SCOOP Event #2-H $1,050 NLHE for almost $125,000, came into Day 2 with a healthy chip lead, but had plenty of tough competition to plow through. WSOP bracelet winner and SCOOP champion Anthony “wwwBTHEREcom” Gregg, Team PokerStars Online pro Lex Veldhuis and JC “PrtyPSux” Alvarado were among the talented folks to hit the rail short of the final table on Day 2. Anderson had a nice run leading up to the final table, highlighted by his pocket aces holding up in a three-bet pot with “probirs”, who flopped a pair of kings and forfeited the rest of his stack to Anderson to bow out in 16th place, according to the PokerStars blog. Anderson was sitting pretty atop the counts to start the final table of nine. Lewis, who was looking to add the third leg of the Triple COOP after scoring a TCOOP title in early 2012 followed by a WCOOP win in 2013, was less fortunate leading up to the final nine. Lewis lost a large chunk of his stack shortly before the last table was set after flopping a set of twos on . His opponent, “tigran66613” committed his remaining stack on the turn and Lewis matched it, but couldn’t fill up to best the flopped flush, as relayed in the PokerStars blog. Mermelstein entered the final table with a middling stack but ran that up in short order by taking out the first final table casualty “zcedrick” in two fell swoops. First, Mermelstein doubled after winning a flip with pocket jacks versus ace-king, finding a third jack on the turn and fading a gutshot Broadway draw on the river. Mermelstein got the rest when his top pair on the flop held against the open-ended straight draw of “zcedrick” to finish him off in ninth. Lewis tried to mount a comeback but ultimately fell in eighth place holding versus Anderson’s pocket tens. The flop looked good for Lewis, but favored Anderson and Lewis’ Triple COOP hopes would have to be set on another event. Next to move up the leaderboard was “FourSixFour”, who got in 6,000,000 chips in a four-bet pot with a dominating ace-king versus Anderson’s ace-jack suited, flopped a king and held. He stayed hot after that, eliminating “ikkedus” in seventh to regain the lead he started the day with. Anderson didn’t recover from the huge hit against the new chip leader. He lost a big one to the rivered trip eights of “krakukra” after flopping top pair of aces with ace-seven offsuit, and the rest went to Mermelstein and his ace-king suited after pocket jacks failed to hold up. Anderson had to settle for sixth and “krakukra” followed him in fifth. Zarco started making a big splash after Anderson’s exit, taking his first lead of the final table and continuing to build on it. “FourSixFour” ran his tens into aces to exit in fourth and Mermelstein followed in third place. That left Zarco with a big lead heading into heads-up with “Manni1822” in a match that only lasted nine hands. Zarco ended things when his flopped open-ended and got there on the turn against the flopped two pair of “Manni1822”, holding on . Zarco’s first major online victory builds on a successful tournament poker career that includes over $2 million in live earnings and a runner-up finish in the 2015 WSOP Millionaire Maker worth nearly $800,000.